We’d like to help parents and schools re-wild their children’s childhoods. There are lots of barriers today in getting children outdoors compared to a generation ago. This includes more road traffic, a more sedentary lifestyle with more time spent watching screens, less availability of wild space and more anxiety about letting children roam. We believe that time spent by children outdoors is essential for their physical and mental wellbeing. It helps them develop their independence, resilience, confidence and social skills . The following tries to encapsulate our ethos for encouraging and supporting both children and grown-ups towards enjoying learning through outdoor experiences that provide a sense of freedom and fun. We hope you agree with our ethos— if you have any question please get in touch. Remember, outdoor activities, are by definition, outdoors! Trees and tarps provide some level of shelter from rain, but generally if it rains we will get wet. It is absolutely essential that all visitors (both children and accompanying grown-ups) come with the right clothing, meaning lots of layers, waterproofs and sturdy footwear (and in the warmer months sun hats and sun cream) as well as a "up for it" attitude to maximising the outdoor experiences for all, especially the children. We aim to spend as much time as possible outdoors but if you are coming out to our woodland site at Tissington then it may be possible to book out the Village Hall as a backup venue in case of sever rain and bad weather. 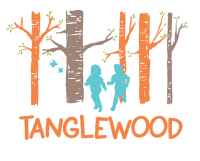 Tanglewood offers sessions year round and in all weathers. The only exception is in extreme high winds when we would have to cancel your session or offer alternative dates. Children and grown-ups should wear clothing that can get wet, muddy and mucky! Children should be given the freedom to get mucky as this is central to exploring their learning. At the end of the day it only means that the washing machine will get some exercise too! Muddy clothes go towards demonstrating active involvement in an activity (for both children and grown-ups). Learning must be fun and exciting - then it can be influential and inspirational. To keep the learner engaged it is absolutely vital that learning is enjoyable and that it always remains fun - this is true for any age of learner - baby, toddler, child, teenager or grown-up. We offer activities for all ages from tots and up. All children should enjoy playing in the outdoors - to have fun, laughter, excitement and happiness through having a sense of freedom. Children are naturally good at this. We aim to be inclusive in our approach. In fact we believe that it is important, positive and essential to welcome diversity and to ensure equality at all times (including and not limited to race, gender, age, additional needs). By participating in fun and exciting activities outdoors we also aim to open children’s eyes to the wonders of nature and instill a love of the great outdoors. In this way children will get a sense of the importance of caring for their environment. If the children share a genuine magical nature experience they are much more likely to want to act in a caring way towards it. We will also try to do our bit and buy locally sourced products where possible and consider and reduce the impact of our purchases on our planet.